Screening is the process of identifying healthy people who may have an increased chance of a disease or condition. This involves offering information, conducting tests and recommending treatment in order to reduce associated problems or complications. The UK National Screening Committee (UK NSC), which is hosted by Public Health England, advises ministers and the NHS in the four UK countries (England, Scotland, Northern Ireland and Wales) about all aspects of population screening and supports implementation of screening programmes. 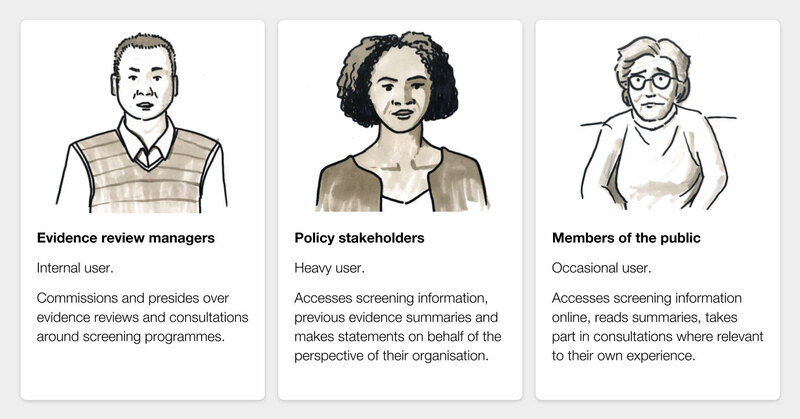 The UK NSC website is a key resource for experts and policy makers shaping screening recommendations, as well as the wider public interested in screening. Relevant content, however, is currently spread across a number of disparate pages with inconsistent use of design elements to tie them together. On top of that, the underlying technical infrastructure is outdated and needs to be reviewed. A fragmented journey with inconsistent navigation makes relevant content difficult to find. Co-location; Public Health England is a busy organisation and there wasn’t much working space available within their offices. Unboxed provided Adrian and the team with desks and wall space for knowledge sharing and collaboration. Engaging stakeholders in four UK countries; the team made it a priority to visit local stakeholders across the UK and gain insights through in-depth interviews. Communicating progress and gaining buy-in; we organised weekly show and tell sessions with video conferencing support to update senior stakeholders spread across different locations. Our research involved a wide range of stakeholders, including charity organisations, academic institutes, NHS clinical directors, patient representatives, clinical specialists and citizens affected by a condition. These were later categorised as 3 main user groups, each with distinct needs from the UK NSC. 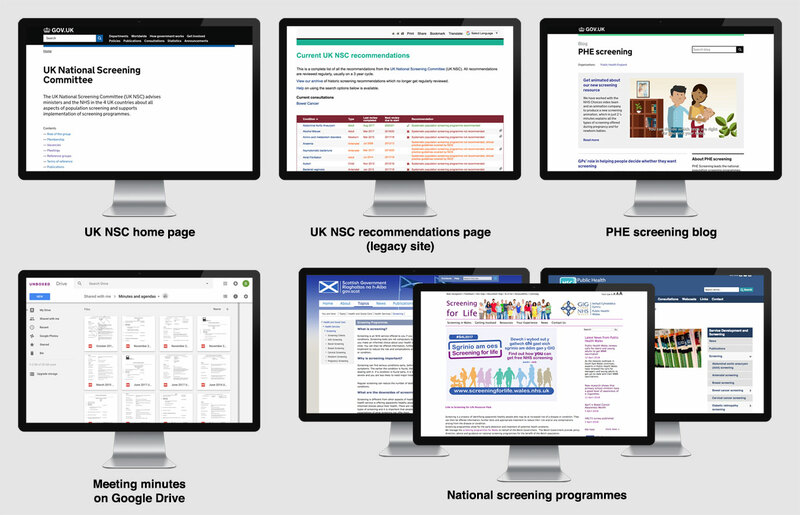 Signposting to a variety of screening resources; good content is already available on the UK NSC and other related websites, but is not always easy to find. The website could benefit from better navigation and signposting to relevant external resources. Independent and UK wide positioning; it’s not always clear to visitors that UK NSC is an independent body with a UK wide remit – this should be better reflected through design and linking to national screening programmes in each of the 4 countries. 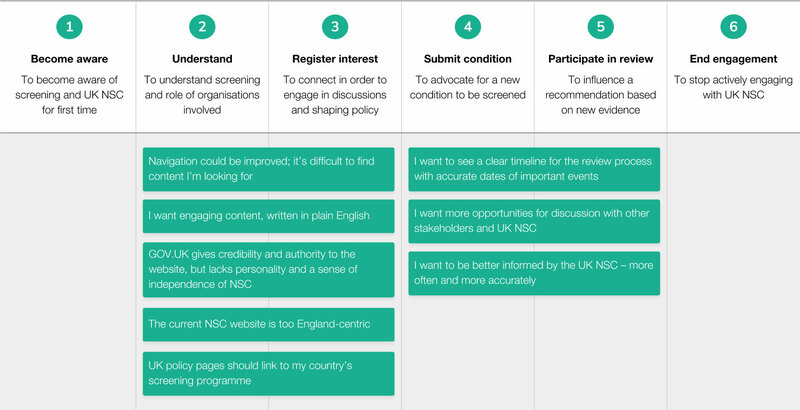 A more proactive and engaging service; there was some indication that UK NSC could do more to engage its stakeholders and the general public beyond publishing recommendations on their website – this could perhaps be done by regular updates through emails or SMS, as well as face-to-face events. This might require a closer look at UK NSC operational capabilities and processes. Leveraging available (open-source) technologies; existing technologies, such as the CitizenSpace platform or various GOV.UK tools, could be used to support the consultation platform. The following Alpha phase will explore the potential implementation of these technologies in more detail. 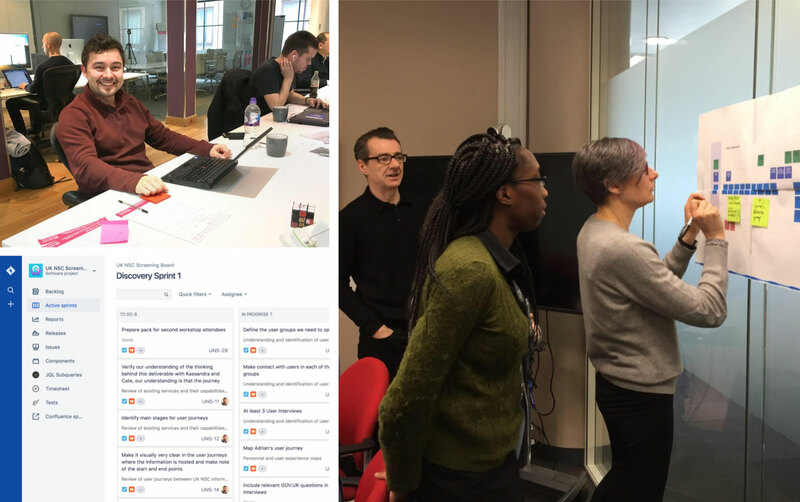 This Discovery phase has brought a fresh perspective to the UK NSC website review, filling the team with newfound optimism and energy to progress the project to the next stage — the Alpha phase. Early validation of the team’s commitment has been delivered through an internal service assessment (based on the GDS service assessment), conducted by the Department of Health and Social Care and PHE Digital. Successfully meeting each point, the team passed the assessment with flying colours. This is just the first step in a positive journey for the UK National Screening Committee. Adrian, the Product Owner, is currently working with the internal PHE team to prepare for the upcoming Alpha phase, in which the next steps will be to prototype and test a new consultation platform for UK NSC screening recommendations. We are confident that this Discovery has provided them with the necessary insights and a solid business case to make this happen as soon as possible.